I am writing to you through my tears on March 14. We have had so much sadness at the sanctuary, and I haven’t been able to bring myself to write about our losses until now. Three of our favorite monkeys have left us with aching hearts. Earlier this year, Lucy and Cappy died together the same night, leaving Puchi alone. Now Jimmy Sr. is gone and Chi Chi is without the loving companionship she cherished for the past ten years. I was privileged to have these three magnificent beings in my life. They all had suffered through long hardships before they found refuge at Jungle Friends. Lucy was near death at the hands of a neglectful hoarder. Jimmy Sr. lived with the abuse from an organ grinder, then more years confined as a pet store display. I am so thankful they all found their way into the sanctuary and into our hearts. 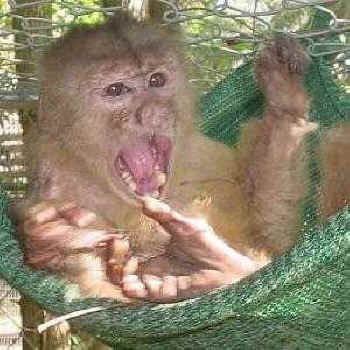 Here they found love and compassion with their monkey and human friends. Every morning was a miracle when we found Lucy still with us, still hanging on though her body was ravaged by cancer. Lucy and Cappy were inseparable, even leaving this life together. They passed within the same hour. Their companion, Puchi, was distraught when his long-time friends were gone, but his many human friends at the sanctuary lavished love and attention on him so he would not feel so alone. In truth, Puchi has recovered from his loss better than I have. I am thankful that Lucy no longer has to suffer, but I just can’t wrap my head around the fact that Cappy is gone. I think monkeys are more insightful about these things. I miss Cappy’s screams of delight whenever I approached -- he was so happy to see me. He wasn’t looking for a treat; he didn’t want anything from me except my love. You just don’t find that kind of love very often and I feel that loss every day. I was not ready for another blow. About 3:00 a.m. yesterday, Mimi alerted me that Jimmy Sr. was in trouble. I ran to his enclosure and my heart dropped when I saw that he was gone. Chi Chi was by his side threatening us, protecting her dear old friend. You could see in her eyes that she was very upset, not sure what to do. She did not want us to take Jimmy from her. I am sure that she felt so alone. Later that morning we moved Puchi and Chi Chi to adjacent habitats, leading up to a formal introduction. 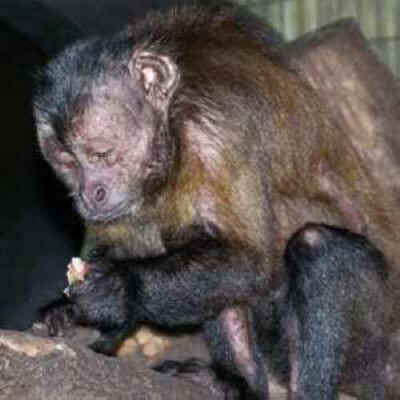 Although they are different species of capuchins, we feel they will be a great comfort to each other. 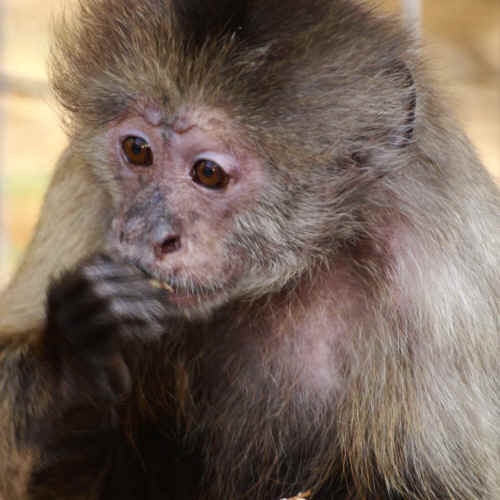 Chi Chi and Puchi are probably the most affectionate monkeys at Jungle Friends. Both are very kind, both are elderly, and foraging is their favorite pastime. We all think they will make a great couple and enjoy a tender relationship. Coming from such troubled pasts, I believe our departed friends found their “golden years” at Jungle Friends especially sweet. They lived their lives here with such enthusiasm, such flair, and that is how we will remember them: Cappy’s huge grin when he spotted a friend or wrestled with his pal Puchi; Jimmy’s amazing leaps when he felled an obliging volunteer with a well aimed bit of mulch; Lucy’s strong spirit as she continued to live and love on her own terms, long past the doctor’s prognosis. I am thankful for the opportunity I had to care for these dear friends, and for the loving memories I will have forever. P.S. GREAT NEWS!! It is now March 15th and we have had a new development - Chi Chi and Puchi are TOGETHER! They were foraging side-by-side yesterday and then Puchi groomed Chi Chi and in the night we found them both snuggled up right next to each other!